Observations from ESO’s La Silla and Paranal Observatories in Chile have for the first time demonstrated a link between a very long-lasting burst of gamma rays and an unusually bright supernova explosion. The results show that the supernova was not driven by radioactive decay, as expected, but was instead powered by the decaying super-strong magnetic fields around an exotic object called a magnetar. The results will appear in the journal Nature on 9 July 2015. GRBs usually only last a few seconds, but in very rare cases the gamma rays continue for hours . One such ultra-long duration GRB was picked up by the Swift satellite on 9 December 2011 and named GRB 111209A. It was both one of the longest and brightest GRBs ever observed. As the afterglow from this burst faded it was studied using both the GROND instrument on the MPG/ESO 2.2-metre telescope at La Silla and also with the X-shooter instrument on the Very Large Telescope (VLT) at Paranal. The clear signature of a supernova, later named SN 2011kl, was found. This is the first time that a supernova has been found to be associated with an ultra-long GRB . In the favoured scenario of a massive star collapse (sometimes known as a collapsar) the week-long burst of optical/infrared emission from the supernova is expected to come from the decay of radioactive nickel-56 formed in the explosion . But in the case of GRB 111209A the combined GROND and VLT observations showed unambiguously for the first time that this could not be the case . Other suggestions were also ruled out . The only explanation that fitted the observations of the supernova following GRB 111209A was that it was being powered by a magnetar — a tiny neutron star spinning hundreds of times per second and possessing a magnetic field much stronger than normal neutron stars, which are also known as radio pulsars . Magnetars are thought to be the most strongly magnetised objects in the known Universe. This is the first time that such an unambiguous connection between a supernova and a magnetar has been possible. Paolo Mazzali, co-author of the study, reflects on the significance of the new findings: “The new results provide good evidence for an unexpected relation between GRBs, very bright supernovae and magnetars. Some of these connections were already suspected on theoretical grounds for some years, but linking everything together is an exciting new development." “The case of SN 2011kl/GRB 111209A forces us to consider an alternative to the collapsar scenario. This finding brings us much closer to a new and clearer picture of the workings of GRBs," concludes Jochen Greiner. Normal long-duration GRBs last between 2 and 2000 seconds. There are now four GRBs known with durations between 10 000–25 000 seconds — these are called ultra-long GRBs. There is also a distinct class of shorter-duration GRBs that are believed to be created by a different mechanism. 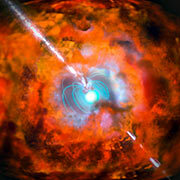 The link between supernovae and (normal) long-duration GRBs was established initially in 1998, mainly by observations at ESO observatories of the supernova SN 1998bw, and confirmed in 2003 with GRB 030329. The GRB itself is thought to be powered by the relativistic jets produced by the star's material collapsing onto the central compact object via a hot, dense accretion disc. The amount of nickel-56 measured in the supernova with the GROND instrument is much too large to be compatible with the strong ultraviolet emission as seen with the X-shooter instrument. Other suggested sources of energy to explain superluminous supernovae were shock interactions with the surrounding material — possibly linked to stellar shells ejected before the explosion — or a blue supergiant progenitor star. In the case of SN 2011kl the observations clearly exclude both of these options. Pulsars make up the most common class of observable neutron stars, but magnetars are thought to develop magnetic field strengths that are 100 to 1000 times greater than those seen in pulsars. This research was presented in a paper entitled “A very luminous magnetar-powered supernova associated with an ultra-long gamma-ray burst”, by J. Greiner et al., to appear in the journal Nature on 9 July 2015. The team is composed of Jochen Greiner (Max-Planck-Institut für extraterrestrische Physik, Garching, Germany [MPE]; Excellence Cluster Universe, Technische Universität München, Garching, Germany), Paolo A. Mazzali (Astrophysics Research Institute, Liverpool John Moores University, Liverpool, England; Max-Planck-Institut für Astrophysik, Garching, Germany [MPA]), D. Alexander Kann (Thüringer Landessternwarte Tautenburg, Tautenburg, Germany), Thomas Krühler (ESO, Santiago, Chile) , Elena Pian (INAF, Institute of Space Astrophysics and Cosmic Physics, Bologna, Italy; Scuola Normale Superiore, Pisa, Italy), Simon Prentice (Astrophysics Research Institute, Liverpool John Moores University, Liverpool, England), Felipe Olivares E. (Departamento de Ciencias Fisicas, Universidad Andres Bello, Santiago, Chile), Andrea Rossi (Thüringer Landessternwarte Tautenburg, Tautenburg, Germany; INAF, Institute of Space Astrophysics and Cosmic Physics, Bologna, Italy), Sylvio Klose (Thüringer Landessternwarte Tautenburg, Tautenburg, Germany) , Stefan Taubenberger (MPA; ESO, Garching, Germany), Fabian Knust (MPE), Paulo M.J. Afonso (American River College, Sacramento, California, USA), Chris Ashall (Astrophysics Research Institute, Liverpool John Moores University, Liverpool, England), Jan Bolmer (MPE; Technische Universität München, Garching, Germany), Corentin Delvaux (MPE), Roland Diehl (MPE), Jonathan Elliott (MPE; Harvard-Smithsonian Center for Astrophysics, Cambridge, Massachusetts, USA), Robert Filgas (Institute of Experimental and Applied Physics, Czech Technical University in Prague, Prague, Czech Republic), Johan P.U. Fynbo (DARK Cosmology Center, Niels-Bohr-Institut, University of Copenhagen, Denmark), John F. Graham (MPE), Ana Nicuesa Guelbenzu (Thüringer Landessternwarte Tautenburg, Tautenburg, Germany), Shiho Kobayashi (Astrophysics Research Institute, Liverpool John Moores University, Liverpool, England), Giorgos Leloudas (DARK Cosmology Center, Niels-Bohr-Institut, University of Copenhagen, Denmark; Department of Particle Physics & Astrophysics, Weizmann Institute of Science, Israel), Sandra Savaglio (MPE; Universita della Calabria, Italy), Patricia Schady (MPE), Sebastian Schmidl (Thüringer Landessternwarte Tautenburg, Tautenburg, Germany), Tassilo Schweyer (MPE; Technische Universität München, Garching, Germany), Vladimir Sudilovsky (MPE; Harvard-Smithsonian Center for Astrophysics, Cambridge, Massachusetts, USA), Mohit Tanga (MPE), Adria C. Updike (Roger Williams University, Bristol, Rhode Island, USA), Hendrik van Eerten (MPE) and Karla Varela (MPE).